This article begins by examining the power of milk as a symbol of modernity par excellence. Scholars have noted how milk came to occupy this position in the west. In China, the dairy industry has experienced a dramatic expansion due to government support and investment as well as an influx of foreign companies since the late 1980s. During this process, milk has taken its place as a symbolic marker of a modern, scientific and urbanised Chinese life. The melamine milk scandal of 2008, however, disturbs and unsettles these images of modernity in a number of key ways. The scandal revealed deep structural and regulatory problems with what had been declared one of China's safest model industries only months before the adulteration problem was revealed.3 Most troublingly, similar issues can be found in food and medicine production across China. Indeed, fake food and fake medicine, along with poisonous air and water, rank as major concerns for Chinese citizens. This article shows how this concern extends beyond China's borders through the global supply chain. Mass deaths in other countries have resulted from poor quality Chinese food products. Meanwhile, Chinese government attempts at increasing regulation and quality standards appear to be inadequate for dealing with this ubiquitous problem. 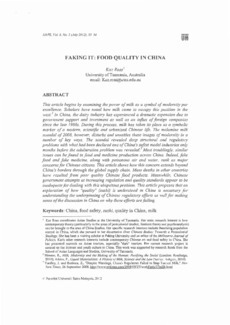 This article proposes that an exploration of how "quality" (suzhi) is understood in China is necessary for understanding the underpinning of Chinese regulatory efforts as well for making sense of the discussion in China on why these efforts are failing.